On November 27th we had a very exciting day! 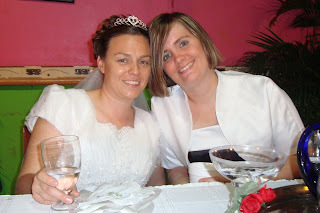 Melinda was a happy bride! 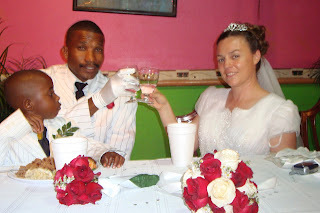 Here are some pictures of the wedding day. There will be more pictures to follow! Melinda and her friend Sharon! Melinda's son, Thomas, came for the wedding! A Baby At The Gate! These 3 pictures have a story behind them! This little baby girl was found outside of our gate at 8:30 at night when a neighbor boy called some of our boys and said, "There's a baby outside your gate!" Amanda came calling me and I thought she was playing a joke on me and it wasn't really true, but I went out and looked behind the gate, underneath the writing on our wall, there was a tiny baby wrapped in a torn blanket with a jacket wrapped around her. There were ants crawling on her and at first I thought she was dead, but I saw her feet move. I gently picked her up and brushed the ants off her head, and took her inside for Melinda to consult. 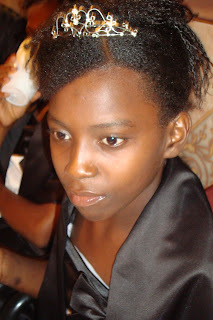 Before we did anything, we took her to the police station to make a declaration that she was in our orphanage. It took about 2 hours to do that. After that we brought her home, fed her, cleaned her up, and put her to bed. 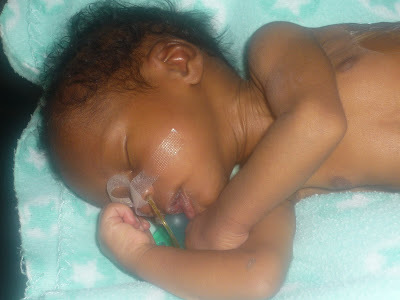 She had an infection in her embilical cord from it being cut and not tied and it was a wonder she didn't bleed to death. 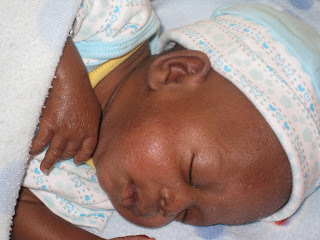 We still do not know whose baby she is so she has been declared orphaned. I named her Hannah. She is doing fine. The first picture is the cardboard outside the gate that she was found on. This is me taking a look at her before we cleaned her up. 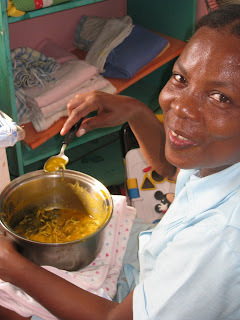 This is Hannah once she had been examined by Melinda and was given a bath and food! Well this morning, we had another set of twins arrive! We have twin boys here already and today, we got cute little twin girls! They arrived shortly after 9:00. Baby A weighed in at 1.4kg and Baby B was just a little bigger, with a weight of 1.75kg. They are drinking about an ounce every 2-3 hours. The mother of the babies died on Saturday from childbirth. We are not sure yet if we are keeping them or just helping the family out. 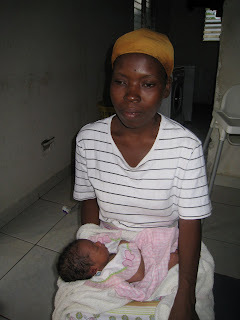 It seems like every time Melinda leaves to go to Port Au Prince on business, another baby arrives! I told Melissa, a volunteer who is here helping us, that I hoped a baby would come during her stay here. Well, we have had 4 babies arrive since she came, which has been just over a month now! We just wanted to let you know that we do not have any power and haven't for a few days. We only have it for a few minutes while it's directly connected to the generator; but we can't run it like this for very long. We are letting you know this so you will understand why we haven't responded to any emails. Please pass this information along to everyone. 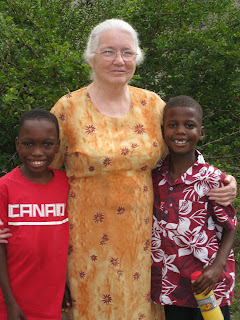 Many folks have asked what it is like living here in Haiti and working at HCH. As a volunteer here at HCH I feel that I have a pretty good idea of what day to day life is like in our home. I arrived in at 10:30 am on yesterday. We got some lunch and then went grocery shopping. During our pretty relaxed shopping we got a call that one of the local pastors who had been sent home to die; needed an iv. Our relaxed shopping turned into a very quick run through the store to ensure we had dinner for our family, volunteers, and 41 orphan children. We then took our 1 1/2 hour journey up the mountain, dodging reckless drivers, and driving acrossed questionable bridges. I was simply thankful that we didn't have to go acrossed in the boats as I did last time. 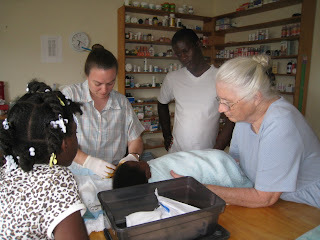 We arrived home to grab medical supplies and then on to the pastor's house. Melinda got the iv in and tried to make him as comfortable as possible amidst the scorching temp with only a fan blowing on him. We visited for a few minutes and then left. Once arriving home we had lunch and then I slept as I was exhausted from only a few hours sleep the night before. Upon waking; I helped hold a baby down while getting an iv as she was quite dehydrated. I then made my rounds loving and playing with the kids. Our houseboy then came in with a cut running down his leg. Pat then had to send for and administer a tetanus shot to him. Shortly after that one of our two year olds was brought up with labored breathing. I administered a breathing treatment to help his breathing. We then finally sit down to have our dinner and yes by now it is 10:30 at night. Is it busy; yes it is so busy. Just when you think you might have a break; somebody comes in whether it be one of our children or somebody from the community needing medical care or just attention. It is rewarding; but very busy all at the same time. Good afternoon. 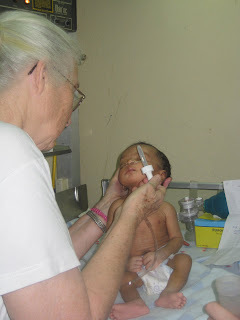 Adlens, the baby of the blind lady from the last blog, is doing very poorly and may have meningitis. This is an urgent request for you to please pray for him. We are working diligently around the clock to help him all we can. This is the position that he is most comfortable in. He seems to need to arch his back and put his head back in order to settle down. We have several children who are sick in the house and we ask that you pray for them and for all of as for strength and wisdom to care for all of them. Davidson was born at the hospital last Sunday weighing a whopping 8lbs 12oz(we're used to 2lb preemies). 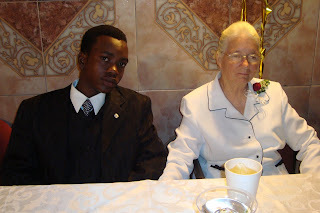 His mother was in a coma and a pastor we know called and asked us to help care for him. He arrived Tuesday and had not had anything to eat at that point. His mother woke from her coma that same morning and left the hospital yesterday, leaving her son in our care until further arrangements are made. This little girl was born with a not fully developed 6th finger on each hand. Melinda removed one near the time of the hurricane, and they came back to ask to have the one on the opposite hand removed as well. Everything went well and she has been back to ensure that there are no issues with infections. 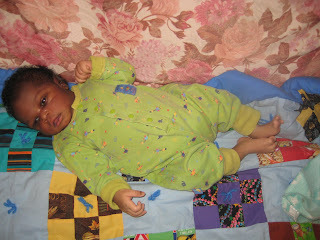 This is the 5th baby that we've seen with extra fingers and toes in the last few months. Later that day the area mayor came in the door with a baby that had been born at 11am that morning. He had not cried, and was in respiratory distress. Melinda had just gone up to town on some business and so Lori and I started oxygen on him and suctioning the liquid he had inhaled during birth. We called Melinda and let her know that we had a bad baby and she came home within a few minutes. In the meantime he stoppped breathing a number of times and we were kept busy watching him. He spent the night vomiting and being suctioned for the fluid in his system. Around 4pm the next day he vomited a large amount of fluid and after that started doing much better. He was taken off oxygen and slept well through the night. We were happy to be able to send him home this morning. We found out that we had taken care of this baby's(Woodson) older sister in 2003 when she had had a bad experience with a cellulitis from a shot she had received by a nurse at the hospital. That same afternoon we had a man bring his sister and her newborn baby(5days old) to us. The brother told us the story of his sister. She became blind from glaucoma thirteen years ago when she was 17. One day all the family but her went to the fields to work, and she was home alone in the house. Several men entered her home, locked her in and raped her. 9 months later this beautiful baby was born. Adlens is a very sweet baby but she is unable to care for him, though she loves him and wants to keep him. We have agreed to keep him until he can walk and she is able to care for him. 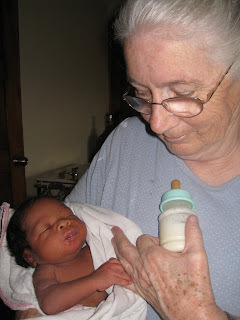 She was so excited to her that her baby had a white grandma! Many of us had tears in our eyes as we listened to her sad story and we are so thankful we are here to help her. So, in a 24 hour period we went from no tiny babies to three little tiny boys. 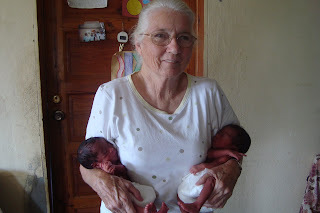 At 3:30 on the 13th, I went downstairs to see a grandmother sitting on my back porch with a tiny baby in her arms. The grandmother said that she had walked a long way to bring the baby here. She said the baby was having trouble breathing and when she handed the baby to me, I thought at first she wasn't breathing at all. But, i soon saw that she was really struggling to breathe and was purple. I ran upstairs and put her on the warming table and had the guys get the oxygen right away. They were really quick and we had it on the baby girl and she started to pink up after a few minutes. Lori was busy running around collecting everything and anything she could think of that I might need, and making sure the oxygen was working alright. We were both praying that this little baby would keep breathing, as there were a number of times we had to arouse her when she stopped taking breaths. I called Melinda to see what advice she would have to help stabalize the baby. The grandmother had made contact with the baby's mother, but she was out of town and had a long way to travel to get here. They had gone to the hospital but there were no doctors on that day, so they sent them to us. We waited and waited for the mother to come, but she did not show up. 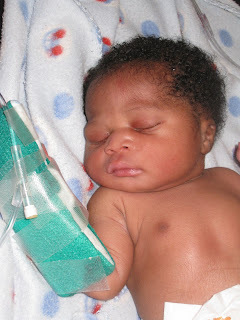 After the baby was stabalized, we thought it best to send it to a hospital so it could have IV therapy and medicine. I was very nervous about taking her off the oxygen and sending her to another hospital 30 minutes away, but I took it off and she seemed to stay stabalized at the moment. So, Mozard our driver and Cedieu and his brother Gabo, all went in the truck with the little family to head to the hospital. They took an ambu bag with them just in case she needed some help breathing. They met the mother on the way, and they arrived safely at the hospital where a pediatrician was waiting for them, and the baby was put on oxygen right away and was doing just fine. We thank the Lord for His help in helping us know what to do to care for this little one. A week ago we we joined by this little boy, Edison. 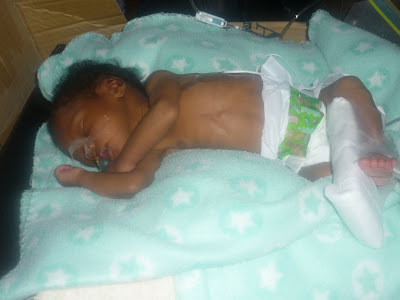 His mother died 4 months ago, and he is dealing with the effects of malnutrition. He is eating well, but DOES NOT like dairy products, which makes it hard to make a diet for him. He thinks I'm his momma now, and he follows me around constantly. His father told us that he is 18 months, but from what we are seeing he is 2 1/2 or 3 years old. He has a whole lot of teeth for being 18 months, and his mannerisms are much more mature than an 18 month old. He calls me momma and then jabbers away. He doesn't like it when other kids have my attention, and is constantly batting at them with his hand. Here's a little update on premature Yvenson. In 9 days he'll be 4 months old and weighs just about 5 1/2 lbs. He's starting to gain weight quickly now, and has turned into quite the spitfire! His mom is here almost everyday to nurse and care for him. She's kind of like part of the house now! He'll stay with us for a few more pounds, probably between 8-10lbs, and then he'll get to go home! Trust in the Lord with all your heart and lean not to your own understanding....please send up some extra prayers for us and the children of our community over the next couple of months. The local hospital has closed for two months because it has changed hands; consequently, all the doctors have left town. Melinda is our only nurse on staff here and she is not home until next Monday and will have to make another trip to the US the beginning of February. This means there will be an absence of emergency care in our village every day Melinda is not here. As this is being written, there is a 10 day old little girl here dying due to a severe respiratory infection. She is cyanotic, gasping for breath and even an untrained ear can hear the rattling in her little chest. 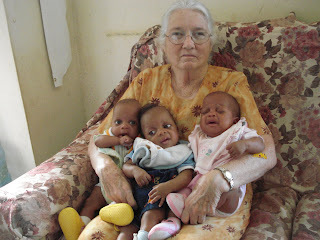 Grandma Pat is standing in the gap; using all the knowledge she has accumulated over the years taking care of children but this little one presents a real challenge. She needs IV fluids as she is too short of breath to drink, she needs IV antibiotics as she is too sick for oral medication and she really needs help breathing but there is no one available to give her these things. 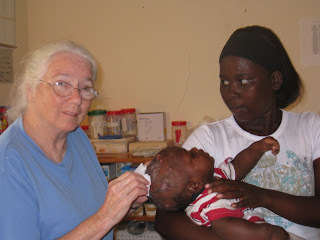 Please put Grandma Pat and this little one and her family high on your prayer list as God is their only hope at this moment. January 1st is a big day in Haiti. 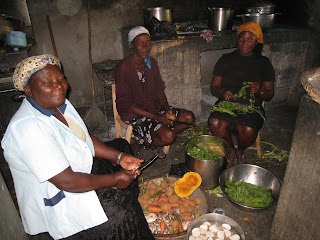 This is when Haitians have their Christmas/New Year's celebration, as well as celebrating their independence day. 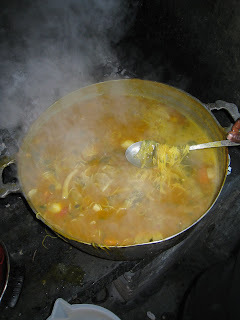 Whenever possible, Haitians celebrate by making pumpkin soup and they go around to all their friends houses and share a bowl of soup. The staff were really excited when they found out that we were going to have pumpkin soup here for them on the 1st. A big thank you to the family who sent the funds to make this possible for them! 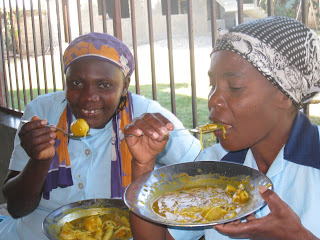 Here are some pictures showing how much they enjoyed their soup! 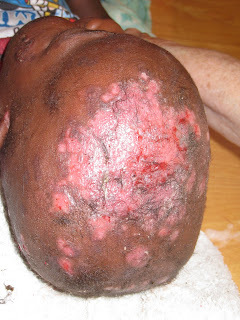 This is a child from the area of Mirebalais who had sores on his head. He came to the house for about a week getting it cleaned and wrapped. After the week was up we sent some cream home with his mom so she could keep up with putting it on his head. Day 2 and when we realized we were going to have to shave his head. It started to heal very quickly after the hair was gone. Here is picture of the triplets. They are doing well at home, gaining weight and being taken care of well. 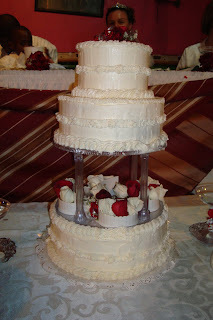 One of our workers' daughters got married and Melinda was supposed to make the wedding cake, but due to circumstances she was still in the states and so, Minnie and I got the job. 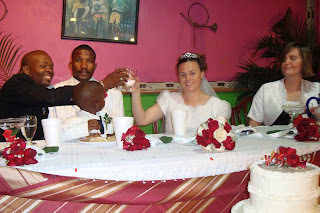 Here I am with the bride and groom and the wedding cake with the red ribbon is the one that we made. We were really thankful that Minnie had payed so much attention to her cake-decorating sister, as she helped to pull this all off and we managed to present a pretty nice cake! Jon and David went to their new homes. This is a picture of me with them. It was hard on the children and workers that stayed behind. Jon is 11 and has been here since he was about 3, and David is 7 and has been here since he was about a year and a half. 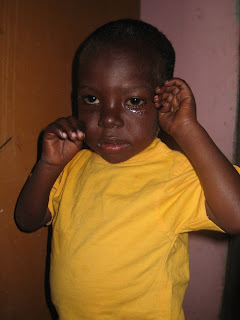 Just to let you in a little news from the project in Jacmel. 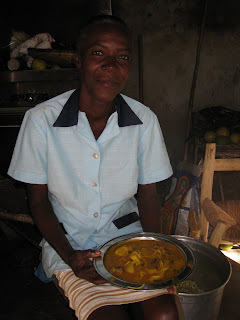 The little town of B'aiu D'orange has many people going hungry, not just children but men and women also. The people were very happy and excited to see the trucks pull in with food, water, clothing, and seeds for them. Mathieu, Mozard and Valdo went in our truck with a load of these things. Due to circumstances the children received help there, and were not transported to orphanages.